* Supports AMD Athlon and Thunderbird processors from 500 - 850MHz at a BUS speed of 200MHz. 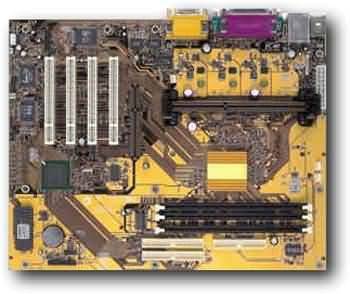 * Supports up to 768MB or registered SDRAM in three DIMM slots. * AGP v2.0 compliant AGP slot. * Integrated PCTel 56K V.90 Voice/Data/Fax modem. * Integrated SiS 900 10/100 Base-T fast PCI Ethernet adapter. * Integrated C-Media CMI8738 3D positional audio system with four speaker output. * Built-in hardware monitoring to monitor CPU temperature, fan speeds, and mainboard voltages. * Supports Ultra DMA 33/66 BUS mastering. * SPDIF digital audio output with 48KHz sample rate. * (2) Serial ports, (1) Parallel port, (1) MIDI port, (2) USB ports and (2) PS/2 ports. * ATX power connector for advanced power management.